Joints in wood connect pieces together to increase their strength, like when a drawer for a cabinet is built. One commonly-used type of joint is a dovetail. This type of joint consists of tails on the end of a piece of wood that connect into pins on the end of another piece of wood. A dovetail joint can be cut with a hand saw or with power tools, such as a router. Verify that the power cord for the table mounted router is unplugged from the electrical outlet. Attach the 1/2-inch bit or 3/8-inch bit to the chuck on the router. Place the 1/2-inch or 3/8-inch spacer fence on the table, over the router bit, making sure the size you choose corresponds with the bit you selected. Secure the spacer fence to the table with the clamp. Plug the power cord for the table mounted router back into the electrical outlet. Turn on the router and run a scrap piece of wood over the bit to test the cut. 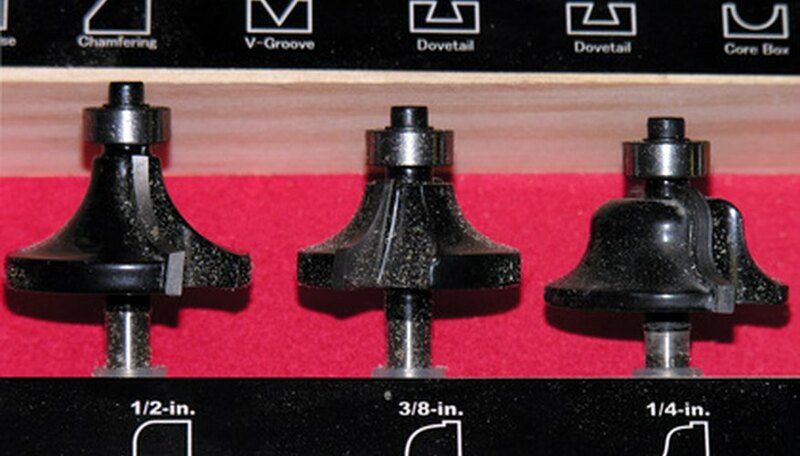 Adjust the depth of the router bit so that it is slightly more than the thickness of the wood that needs to be cut. Set the wood block on the table, behind the router bit. Place the wood to cut against the block with the edge facing the table. Turn on the router and make the first cut in the wood. Lift the wood up and place the first cut over the guide on the spacer fence. Make another cut in the wood. Repeat this step until you have finished cutting the wood. Cut dovetail joints into another piece of wood, observing the same spacing as selected for the first piece. Place the two cut ends of the wood together so they interlock to test the fit of the dovetail joint. Test the cuts on the scrap wood or you may ruin one or more pieces of good wood. The Router Workshop: Easy To Make Box Joints &amp; Dovetails!